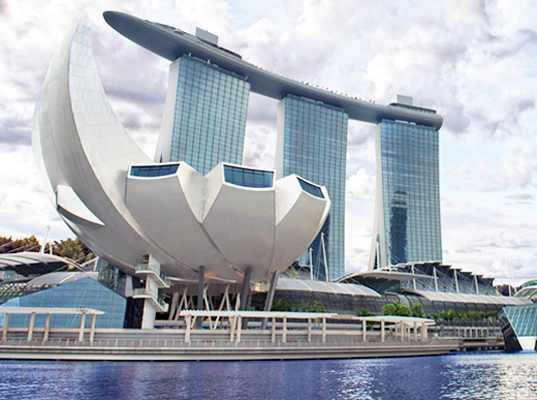 When the Marina Bay Sands development was built on a massive reclaimed site in Singapore, the government required a massive cultural investment from the developers to offset the massive casino. Probably due to pressure from the Israeli-born architect, Moshe Safdie, a museum that combines art and science is at the heart of the development. And it’s still at the political heart today. Looking down from the world’s highest infinity pool you see the partly unfurled lotus flower of the ArtScience Museum. Honor Harger, formerly of the Lighthouse in Brighton, directs a programme that includes blockbuster exhibitions such as ‘the deep’. But when these touring crowd-pleasers reach Singapore they find themselves with novel artistic elements built in (such as Lynnette Walworth’s fabulous incandescent vases) and these elements become incorporated into the shows as they make their way round the world. In autumn 2015 a show partly developed there is opening in the Saatchi Gallery in London so the cross-pollination is vibrant.